Mental health issues tend to be an area of society commonly ignored by popular culture. Books, television programmes and films tend to skirt around portraying mental health problems, and when they do tackle them, it can often be a sanitised or unreal experience that follows. Comics have fared better for their portrayal of mental health problems – self-publishing allows many creators to tell their stories their way, on matter how harrowing or stark their story may be. Darryl Cunningham’s Psychiatric Tales or Jason Gilmore and Paul Peterson’s The Next Day are two such acclaimed examples. Now Ravi Thornton’s HOAX enters the fray. Thornton has previously crafted cross-media experiences with her first graphic novel, The Tale of Brin & Bert and Minno Marylebone, winner of the Broken Frontier Best Debut in 2012 and later nominated for the Bram Stoker Award. Here, Thornton’s latest cross-media experience attempts to answer one question: Can a potent chemistry of poetry, comics and performance finally be the perfect way to describe the realities of schizophrenia? The HOAX project has been split into two main strands, a stage play premiering this week at Manchester’s Royal Exchange, HOAX: My Lonely Heart and the graphic novel reviewed here, HOAX: Psychosis Blues. The starting point for the project was a poem written by Thornton’s younger brother Roabbi, or Rob as he was known, who committed suicide in 2008 at the age of 31 after a long battle with schizophrenia. It is this battle and Rob’s poetry that form the spine for the graphic novel and play. His poetry is lyrical, sometimes frightening, yet sometimes hopeful. The jumbled language and stark phrases embody and give voice to his struggle and thoughts. Opening with Thornton’s visit to her brother as he is institutionalised, it follows their relationship over the next nine years, dipping in and out of the life through a series of brief interludes. Thornton’s prose together with Leonardo M. Giron’s artwork produce these snapshots into a topsy-turvy world where you never quite know if this is going to be a good day or a bad day for Rob and those around him. Interspersed with this are Rob’s poems, illustrated by many up and coming as well as famous illustrators including Bryan Talbot, Hannah Berry, Ian Jones and Rian Hughes amongst others. Rob’s poetry can be an assault on your senses when combined with the often surreal and different styles of artwork. The range of emotions and sea of imagery contained within the words and illustrations threaten to overwhelm. But this is the whole point – the disorder and contrast of styles conveys the kaleidoscopic nightmare and reality of schizophrenia to those of us who cannot understand what living with the condition is like. Yet the artists who illustrate these poems bring their voices to them as well. Mark Stafford’s exaggerated and horrific illustrations accompanying ‘Roach Psychiatry’ characterise the blank-masked psychiatrists with a grotesque look as Rob asks “Why play such games with my reality?” whilst Karrie Fransman’s art for ‘A Desolate Spot’ presents a more fragile and withdrawn Rob as he desperately fights against his madness. Fransman’s simplistic artwork balances out Rob’s intense ‘warning’ that he urgently repeats. Rozi Hathaway’s art for ‘A Load Lifted’ provides a powerful and uplifted coda to the main narrative. Heartbreakingly, just as you start to get an insight into the man and the condition, he’s gone. The last couple of sequences present a freer and happier Rob, unleashed from the chains of his condition. Despite you know that Rob commits suicide at the outset, the concluding scenes of Psychosis Blues are poignant and touching and allow the narrative space to consider the impact beyond a singular act to encompass the thoughts and feelings of those around. In one shocking comment, it becomes clear that Rob’s family were denied the chance to say goodbye in person and highlights feelings of loss, anger and grief. What is so rewarding about this piece is that Rob’s legacy has lived on. He had a wish to see his work in print and that wish has been delivered in such a unique and emotive way that ensures his legacy is not only one of appreciation of his work, but opens and extends the debate about mental health issues. HOAX is an extraordinarily powerful and brave narrative for Thornton to have produced and make sure was told. But it is also a beautifully crafted and very real story that commands your attention. It is also a brutal and raw story, there’s no denying, but it is one that gives hope. There is support for sufferers of mental health issues, that despite what they may think there is always a way for their voice to be heard. As Rob’s words tumble onto paper, many sufferers of mental health problems have commented that this is exactly how they feel. For those of us who cannot emphasise, we get a valuable window in the dehabilitating effect of such issues. There is no sugar coating of events here, everything oozes from the page in its raw honesty. Exhaustively powerful, it is set to be a defining story for those not only suffering from mental health issues, or their support network, but also for those ignorant of them as well. HOAX: Psychosis Blues is certainly one of the best graphic novels I’ve read this year, and is a story deserving of your attention. 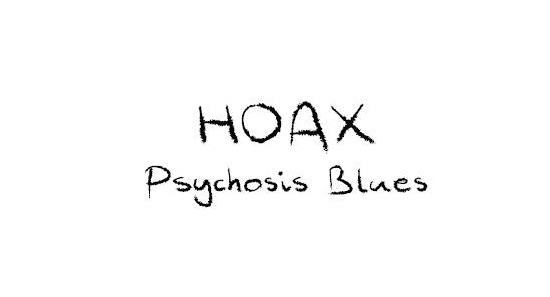 HOAX: Psychosis Blues is available now from Ziggy’s Wish. Proceeds from sales will help to support mental health charities. There is a signing event at Manchester’s Travelling Man this Saturday, 7 June at 3pm. The stage show HOAX: My Lonely Heart continues at Manchester’s Royal Exchange Theatre until Saturday 7 June.